I absolutely love hummus. The best hummus I ever had was in Istanbul. It was the perfect smooth consistency with just the right combination of lemon and garlic. I'll never be able to top that, so I decided to try a checkpea-less hummus. I used zucchini - mostly because I had a bunch on my countertop, but also because I knew it would blend up well in the food processor. Combined with the lemon, nutritional yeast and tahini, it was a hit at my house as we chowed down while catching up on Suits. Put all of the ingredients in a food processor and process until smooth and creamy. 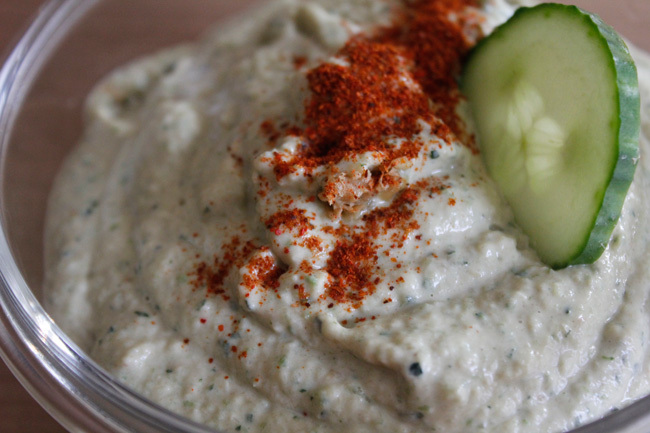 Serve chilled with cucumber, celery, broccoli, or whatever you like to dip. Note- I tried this with both a vitamix and my food processor, and I preferred the consistency of the food processor.